Accurately track incoming and outgoing shipments, logistical information, or inventory with the Winholt RDSWN-4 32 1/2" stationary receiving desk! 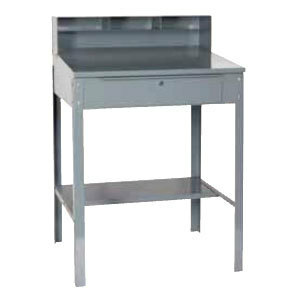 This receiving desk is mounted on a tall set of legs to keep the desk at the most comfortable writing height, and a spacious undershelf gives room for additional items. Pencil and paper compartments provide convenient storage areas while the slanted writing surface gives a comfortable place for your staff to take down notes and records. Uniko Manufacturing Ltd. PA-04 "Shipping" Arrow Aluminum Composite Sign - 36" x 12"